Mystic Seaport, just under an hour's drive from Hartford and a popular excursion from the city, allows visitors to experience a classic New England seafaring community. Its four sections include a restored 19th-century village, comprising more than 30 shops and businesses; the waterfront, featuring tall ships and other historic vessels that visitors can climb aboard and explore; the preservation shipyard, where antique vessels are restored using traditional methods and tools; and a collection of galleries and exhibits. 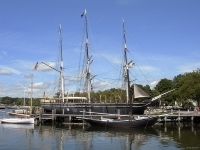 Mystic Seaport, which describes itself as 'The Museum of America and the Sea', is the perfect family destination, with several restaurants, boating activities and programmes for children. Admission: $29 adult, $19 children, other concessions apply.